This 90 minute class is jam-packed with Instruction, Ideas and Inspiration. Please join me and learn how to make these, extremely versatile and fun to wear, Magnetic Pendants. Nouveau: Nous avons maintenant traduit la narration du vidéo en français. Voir plus d'infos ci-dessous. Once you enroll, the first 3 videos and the Materials List PDF can be viewed for free. Purchase the class, ($20 US), in order to see the remainder of this fast-paced tutorial full of detailed instruction, clear visuals and beautiful examples. You will love wearing your creations! Your purchase entitles you to unlimited views of the class. These videos can be downloaded for off-line access. 100% money back guarantee within 30 days of purchase. Nouveau: Nous avons maintenant traduit la narration vidéo en français. Notez que ce n'est qu'une traduction approximative qui a été faite en utilisant Google Translate et n'est pas une version française de cette classe. Nous espérons qu'il sera utile aux utilisateurs francophones qui ont de la difficulté à suivre la vidéo. La traduction des sections Introduction et Essentiels du projet est disponible gratuitement pour que vous puissiez voir si la qualité est adaptée à vos besoins. Thank you so much. I spent last night watching everything and LOVED IT!!!! The class was extremely well done with the video lengths and content just right - I never found myself wanting to fast forward through it. Plus Helen's commentary has the right touch of humor and helpful tips to keep you engaged from beginning to end. I also appreciate how much time and effort went into the crafting of the series. You thought of just about everything and took the guess work out of figuring out what techniques were used in each piece and which video it was on! Brilliant!!! And the PDF resources are fabulous. Artist, instructor and course creator, Helen Breil has been working with polymer clay for over 20 years. To learn more Click here. My goal is to give you the best possible learning experience. This tutorial is worth every penny! It is extremely easy to use, and to find information to go back to as you progress in your work. Except for having to "rewind" each video to view it once it has been initially viewed, the format is exceptional. Helen, keep these coming, please. Your design, proficiency and technique are the BEST, and your attention to detail is beyond excellent. Thank you for sharing your knowledge...this tutorial has really been inspiring to my work. Mad for Helen Breil's talents, designs, ease of teaching. This is a wonderful, wonderful learning session. I thank you so much. I had a few difficulties with sound being too faint, but sometimes if I got out and came back in, it improved? Anyway, no matter, I loved this course. THANK YOU SO MUCH for this course. I shall be referring to it over and over for the inspiration, the "perfection" you achieve, and your wonderful way of explaining things. I absolutely LOVED this video class, I have spent the afternoon savouring every glorious detail. Fabulous instruction and inspiration with totally awesome end results. Who knew a plastic knife could give texture like that – WOW! This has been by far the most useful tutorial course I have ever watched. The texture portion was eye opening, as well as shape combinations. Chock Full of Technique, Hints and Tips! Helen Breil's instructions are clear and precise. The photography and video in her course are always well lit, and show the student exactly how to complete each step. The course offers plenty of technique, tips and hints allowing the student to complete professionally finished pieces. Yet, the course material is broken down into short, easy to learn steps. If I could give 6 stars, I would! Yet another exceptionally inspiring course from Helen Breil! This course is absolutely packed with great information! Like her other courses, Helen includes SO much information in this course in addition to the instructions for completing the main pendant. She goes over many ways to create and modify textures and texture sheets, color ideas using various media, and loads of design tips and ideas, from shapes and focal points, to various stringing materials and ideas. The course is very clear and easy to follow with detailed instructions and makes it very easy to end up with a stunning & functional finished piece (or two or three or.... you won't want to stop creating them!!!). The combination of Helen Breil's breathtaking designs and her extraordinary skill with polymer clay (and all the other components) makes this course an incredible value! Clever idea to use magnets. This is magnificent: Logical, well presented, beautifully crafted pieces. A pleasure to watch and work along. With links to more in-depth discussions or tutorials. Not one little bit of information was withheld. Beautifully explained. Your work is classy, perfectly made, contemporary and anyone would love to wear them. The idea of using magnets is brilliant. This course is clear, concise, and detailed, giving all the information at a pace that makes it easy to understand and execute. The designs are utterly beautiful. It is not only inspirational but full of wonderful ideas which will jumpstart your own ingenuity. I can't praise it highly enough. I am so grateful for the generosity of this lovely artist in sharing her beautiful techniques and ideas. Like all of Helen's tutorials, this one is also excellent! She gives so much detail and so many examples! It's very inspiring. I highly recommend this tutorial. I made several pendants using her guidelines. Then, I ordered some magnets. Boy, are they strong! I waited several months before deciding to work with them. I went back through her instructions on using them and gave it a go. No problems! What was I waiting for?! Thanks for the great videos! Clear instructions, many beautiful examples and combinations, a very good value. Now if mine will turn out even one quarter as lovely I will do a happy dance! This class is fantastic. I cannot say enough great things about it! It is the best $20 you will ever spend for polymer techniques, and her generous tips and tricks. I have taken live classes with Helen before and they are wonderful. But it is great to be able to refer back to all of the information she gives you in this video and PDF class. I would highly recommend this for anyone that loves working/playing with polymer clay. Helen speaks very precisely and clearly and the class is set up in short sections so that if you want to revisit a certain part - it is very easy (no fast forwarding all over the place looking for what you want). And she even has TEXT that outlines each lesson on the video. Her detail and organization is so impressive. She is really a master polymer artist IMO!!!!! Bravo Helen! Thank you for your contribution to the polymer world! Loved, Loved, Loved Lynn Rogers Vail Chagrin Falls, Ohio P.S. Helen's website is also phenomenal! So lovely to look at, so professional, so easy to navigate ... just perfection! I really enjoyed this class. Very clear instructions. Well done. Helen! What a phenomenal amount of information you have given us! Techniques, colours, layouts, patterns, inspirations ... Wonderful! Great class! J'ai vraiment adoré ce cours. Les explications sont très claires et précises. Les idées sont originales, et la mise en pratique facile. J'avais déjà essayé d'utiliser des aimants, j'ai hâte de créer mes propres pendentifs ! Merci pour ce fabuleux partage. This video is precise, helpful and so full of ideas that my mind is brimming. I can't wait to get started. It has given me permission to slow down my process and play more with the materials to find my own creativity. I couldn't recommend a tutorial any more than this. I can't wait to try some of Helen's other tutorials. Thanks, Helen. What a treasure! Great class, just as I expected. More bang for the buck. Helen always gives more information then other instructors. Her class is extremely informative and fun to watch. Love all the extra tid bits of knowledge and advice. I have her Shapes demo and most of the texture stamps and silk screens she has to offer. It was a real pleasure meeting Helen at our Clayathon in New Jersey this last weekend. She is a very classy lady just like her work. Love it all. This is the best tutorial I have ever taken. It is amazing how much effort Helen put into this course so that we would clearly understand her process. She is a true educator and cares about sharing the fruits of her talent with others. 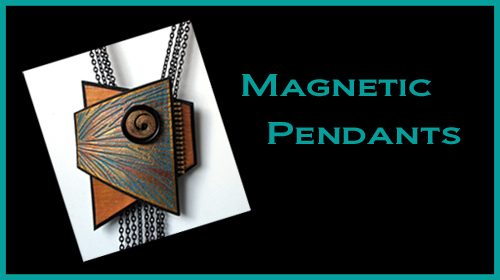 Magnetic Pendants is inspiring and challenging. Helen presents techniques that are achievable for all who work with clay. Thank you Helen for the gift of this course. I have Helen's other tutorials as well, so I knew this would be well documented and have extensive examples to go with her projects. This one is easily as good and possibly better in some ways - she just keeps knocking it further out of the park! I wish all instructors had her attention to detail and supporting materials. Thanks, Helen! Helen, this is a fabulous tutorial. There is so much care, thoughtfulness, wisdom and generosity evident here. And compassion!! Why compassion? Because you have included a text narrative!! As someone who has only 25% hearing and who ALWAYS struggles with video, this was such a delight. I have also spent a lot of time writing instructions for ladies I work with in Nepal and I know how hard it is to get everything included and to make steps logical and clear. I don't always succeed. You have. I will recommend this video in all my classes and will come back to it again and again. You have generously donated this to the Samunnat ladies and we are deeply appreciative of that! We will be working in Nepali time, but I am sure you will see evidence one day!! Thank you, thank you. absolutely excellent layout for clarity of instruction. congratulations Helen Breil on a well presented tutorial. Helen is a talented artist and generous teacher. There's something to learn in this course whether you are new to polymer clay or an advanced clayer. Helen Breil creates beautiful jewelry and in this class she does a beautiful job of sharing her techniques. The class is easy to follow and she provides all the information needed to be successful! Thank you Helen! This tutorial is excellent and gives all the information you need, both in the videos and the pdf print outs. Really could not ask for more, and is good value. The step by step instructions are clear and the last three sections where Helen talks through twenty other designs are inspirational. How to do lots with relatively few basic elements. Will keep me busy for quite some time. Thanks, Bella Green. This is a great tutorial. Very detailed. I love the additional items you can print out. I also am hearing impaired and heard most of the video. Wow, Helen Breil is so generous in sharing her expertise. Not only do you find out all you need to know about how to make magnetic pendants, but you also get a superb masterclass in texture techniques and great examples in the gallery of what can be done with the techniques she has shared. And she talks you through how each example piece in the gallery was made as well. This is a 5 out of 5 stars. I'm itching to play with clay! Title says just what the Pendants are. Text is very clear and very detailed. Very thankful to have with video to instill more knowledge. I have been waiting for Helen Breil to release some sort of video tutorial ever since I discovered her work on Pinterest... and she came through - BIG TIME! I just spent the afternoon slowly savoring, replaying and enjoying all the great videos moderated with her crisp, precise voice. The videos are clear and close up, she painstakingly covers each and every step and then follows up with everything in writing via PDF files. It just couldn't get any better than that! My head is reeling with everything I learned and I plan on watching the videos over and over again. I can't wait to get started on my own projects. Ms. Helen, God has surely blessed you with an amazing talent, and the fact that you are kind enough to share it with us is truly appreciated. I look forward to many more of these types of classes from you in the future! God bless you. This class is a wonderful class which is packed with tons of information. i like the idea of using magnetics in some of my work which I will. I am excited about using the different texturing techniques that were shared, very excited!!!. Helen gave a lot of inspiration in her work, clean and modern which I just love. This is my first class ever online and I felt like I was in a class room with all the information she provided for you - templates, instruction guide, resources and even the whole video class in texts. I do own two of her textures stamp sheets and two of her silk screen sheets and love them. I can go on and on but have to go back to class and study some more!!!!! Thank You Helen!!!!!!!!! As a hearing-impaired person who struggles with tutorials that have audio without a visible speaker, I am singing the praises for this one! Helen is extremely careful to enunciate and to speak slowly so that each word can be understood. I heard every word and I understand everything! I have learned so much with this tutorial. My favorite section is the additional texture demonstrations but the "architecture" of building all of the elements into a beautiful design are so meticulously-presented with attention to important details. The steps are very clear, the entire presentation extremely well-organized and easy to follow. Wonderful format and worth every penny. Thank you so much for the great care you took in producing this tutorial. Love Love this tutorial, can't wait to make some necklaces. Thank you for the ! Loved this tutorial. Helen shared so many interesting texturing and design techniques. A light bulb moment...for me..."Its all about the texture!" I love it. Need all the help I can get with designs and this tutorial was fascinating. Simple elements can make very elegant and wonderful pieces of jewelry. Thank you so much Helen for sharing your talent when working with polymer clay. Can't wait to get needed supplies and get started. Thanks again! This is an excellent tutorial. Subject matter is well covered. Illustrations are clear. There are so many tips and tricks that only are available when the author has has so much experience and obvious passion for sharing her work. Helen is a wonderful teacher, instructions are clear and too the point. The availability of the PDFs is especially appreciated as I live in a rural area and internet is not always up to speed. Thanks Helen.